Pythagoras was a Greek mathematician known for formulating the Pythagorean Theorem. He was also a philosopher who taught that numbers were the essence of all things. He associated numbers with virtues, colors, music and other qualities. He also believed that the human soul is immortal and after death it moves into another living being, sometimes an animal. Pythagoras believed the earth was round and that the sun, moon, and other planets had their own movements. His beliefs eventually led to the Copernican theory of the universe. The principles of the Pythagorean Theorem had already been known before they were formulated by Pythagoras. The Egyptians used a form of the Pythagorean Theorem to lay out their fields and the Greeks borrowed it from the Egyptians. The theorem says that in a right triangle, the square of the hypotenuse equals the sum of the squares of the other two sides. A right triangle is a triangle where one angle equals 90 degrees and the hypotenuse is the side opposite the right angle. If you know the values of two sides of a right triangle, you can easily calculate the missing side. The Pythagorean Theorem has many proofs. 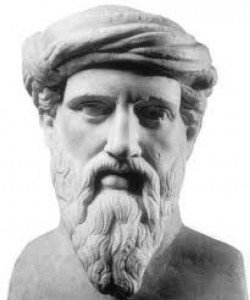 One of the most famous was that of Euclid, the Greek mathematician who was born around 300 B.C. Pythagoras also developed a method of tuning instruments called the Pythagorean tuning. If Pythagoras committed any of his theorems or thoughts to paper, no one has yet found them, though there were forgeries. Pythagoras seemed to have favored oral teaching. Not too much is known about Pythagoras’ early life. Some scholars believe he was born on the island of Samos and that his father was either a merchant of some kind or a lapidist. His mother’s name might have been Pythais. An oracle told her she would give birth to a well-favored son. It is possible that Pythagoras had a variety of teachers as a boy and a young man. Some of these teachers were Greek and some might have been Egyptian or from the East. It is even said that he might have been taught ethics by a woman called Themistoclea, who was a priestess from the oracle at Delphi. Around 529 BC, Pythagoras settled in Crotona, an Italian colony, and founded a school, or a brotherhood, among the city’s aristocrats. No one is quite sure what was studied at the school because its members were very secretive about it. They seemed to also have followed an ascetic lifestyle. Some scholars believe that the school was actually a religious sect. However, the citizens of Crotona were suspicious of the brotherhood and killed most of its members during political uprisings. Scholars still are not sure whether Pythagoras left the city before the violence broke out, whether he survived it, or whether he was himself killed during the uprising. It is likely that he Pythagoras died in Metapontum, another Greek colony.